We have been having fun playing in the snow around here! Not just the kids either.....Here I am riding on the sled with my little girl....so fun!! Thank-you Grandma and Grandpa for getting the idea to take us to Great Grandma's to go sledding!! My grandma has a wonderful driveway for sledding....So, after a day of playing in our yard and across the street at the park my mom and dad called and asked if they could take the kids sledding at my grandma's. Well, one day of sledding at grandma's became 3 days in a row of sledding at grandma's! It was so much fun and you never know how long the snow will last, so you gotta enjoy it while you can!!! Hope everyone is enjoying their winter!! Here is Great Grandma staying warm….watching from in her home!! Brrr…..it started getting dark and raining and freezing….but, they sure had fun! I love Chrstmas traditions... actually...I love all traditions. But, one Christmas tradition that is very special to me is....On Christmas Eve Morning! My grandmother has a granddaughters brunch. All my girl cousins gather at grandmas home and we help make crepes and enjoy them together. Then we do the dishes and play some games and visit. We all look forward to this tradition every Christmas Eve Morning! You can share a favorite Christmas Tradition on this blog… http://thethingsilovemost.blogspot.com/ and you will have the chance to win a free Christmas CD! yippee! OK....why not join in the fun black friday spirit....Buy a cookbook from me now through Saturday and save!!! $10 each or $11 if needing shipping! Great holiday gift for someone you love that has food allergies or gluten intolerance. Let me know! I was just reading on Cybele Pascal’s Food Allergy Blog (which I love to read and check out frequently!) She had posted about Allerbling bracelets for kids with food allergies. I had never heard of them before and they sound great! You can learn more or order these at www.allerbling.com! Also, if you haven’t checked out Cybele’s website go here www.cybelepascal.com and enjoy! If you are a member of FAAN---great!!! If not check out what they are all about….www.foodallergy.org and don’t forget to take advantage of their 20% off discount going on now! FAAN™ (The Food Allergy & Anaphylaxis Network) was established in 1991 by Anne Muñoz-Furlong, at a time when information about food allergies was difficult to find. Anne's daughter was diagnosed with milk and egg allergy, and founding FAAN was a way of providing education and support to the many other parents who needed help managing food allergy. FAAN is now the most trusted source of information, programs, and resources related to food allergy and anaphylaxis. Its membership now stands at approximately 25,000 worldwide and includes families, dietitians, nurses, physicians, school staff, and representatives from government agencies and the food and pharmaceutical industries. FAAN serves as the communication link between the patient and others. Are you ready for trick-or-treating? Well….it is that time of year when all the kids get excited about costumes and candy. But, for those with food allergies, it can be a very scary thing! Below is a list from allergymoms of some allergen free candies (be sure to read the labels to make certain they are free of your allergen)!!! Hopefully this will help some of you! I found this little video on the allergymoms website and thought I would share! I love to make cookies with my kids! I probably love it too much! The first recipe I ever created was a cookie!!!! Well…..while we were out of town the past few weeks….I was desperate! We were in a town without a health food store and I didn’t have all the ingredients I needed to make some cookies, so I went to the grocery store and searched for something to make and I found these nifty little boxes of cookie/cake mixes that are allergy free!!! I was so excited I bought one and made the batch and they were so fast and delicious!!! So, the next day I went back to the store and bought a supply to take home!!! Why I love this time of year…..
1. I love the start of a new school year. 2. I love to take my kids to find awesome deals on school suppies. 3. I love to spend a few days getting the school room ready. 4. I love to see how excited my kids get to start a new school year. 5. I love to get back on a regular schedule (don’t get me wrong…I love summer vacation too). 6. I love to teach! Best of luck to everyone this new school year!!!! I love back to school time!!! We kick off the new school year with a fun pencil cake….my kids love it!!! Try it out this year!!!! How many of you are ready for Back to School? See the allergist. Your allergist will go over details of your child’s Food Allergy/Emergency Action Plan and update it for the new school year. The allergist may also assist with your child’s Individual Health Plan (IHP) or 504 Plan, if applicable. Meet with key school staff. Examples include the principal, nurse, teacher(s), director of dining services, and bus driver. Go over how your child will be able to participate in all activities safely (i.e., lunchtime, field trips, class parties, lesson plans that involve food). Come up with a plan for where medications will be stored and determine who will access it in the event of an emergency. Check medications. Check the expiration dates on all of your child’s medication to ensure they are current. If they are to expire during the school year, mark your calendar accordingly to request a refill from the physician at that time. Keep records. Make a binder and keep copies of your child’s medical records and his or her Food Allergy/Emergency Action Plan, IHP, or 504 Plan, and any written correspondence between you and the school. This is also a great place to store notes on what part of the management plan worked well and what could use improvement. In the event that a question or situation comes up during the school year, you can refer to your binder to see if the situation was addressed during any of your meetings. Keep contact information up-to-date. Cell phone numbers and e-mail addresses often change. Any time a change is made to your personal contact information, be sure to provide the school with written record of the change. Offer to volunteer. If your schedule allows, consider volunteering to be the room parent so that you can be involved in classroom celebrations that may involve food, or can accompany the class on a field trip. Familiarize yourself with FAAN’s extensive resources, found in our Back to School Toolkit. We have free downloads, free slideshow presentations that will help you educate school staff, and many educational materials available for purchase. Take a deep breath! Preparing ahead of time will help you relax as you ease into the new school year. Remember, we’re all in this together. We wish you success! The Entitlement Trap by Richard and Linda Eyre is being released in a few weeks so the Eyre’s are doing a GIANT giveaway for anyone who pre-orders the book! Are you ready to get back into school routines? Take a moment and listen to this free podcast from The Power of Moms for some great ideas to get you off to a great new school year! I have lots of cookie recipes in my cookbook. I love making cookies in my home. I have lots of memories of cookie baking from when I was a little girl. Every Sunday, my dad would say, “I think we should make oatmeal chocolate chip cookies today”. So, we would make the BEST oatmeal chocolate chip cookies! My dad had so many little tips to each step of the cookie making process and I learned how to make one yummy cookie! I also made sugar cookies with my great grandma. She had some very special cookie cutters that I had to be extra careful with. My grandma made cookies during the great depression to earn money. Well, my love of cookie making and my wonderful “teachers” have actually helped me in creating allergy free treats! One thing I learned very quickly in my allergy free cookie making is that you have to chill your dough! After making your dough, place it in the fridge for 1 hour (gluten/allergy free) dough is very soft and will not turn out “perfect” if it isn’t chilled. So, make sure you give yourself that extra 1 hour of “baking time”. Good luck with your baking adventures….and Enjoy those yummy cookies and the memories you are making!!! Why I started my blog…. About 8 years ago…..my son was diagnosed with food allergies and I had no idea what was to come. I understood what a food allergy was but was shocked to find out how severe they really can be. So….I had to search and search for help! I needed help with so many things. I needed to find recipes that my son could have. Well, I was able to find some but they were not that great. So, I began creating recipes of my own. I then realized how great it would be to make my life easier if I could create recipes for our whole family so I didn’t have to make 2 meals, or 2 kinds of desserts. Then I began to get requests for certain foods at family/social gatherings and requests to write a book (this is how the cookbook all started). Then, I would have people ask me if I blogged and if I could just share ideas/helpful hints. So, I started this blog. I started it to help others to hopefully cope with their food allergies or gluten intolerances. I love being able to see that there truly are others in the same boat and we can learn from each other!!!!!!! !So, welcome and if you ever have questions or need help…..I am just an email away! Oh what do you do in the summertime…. Well, one thing I love to do is….make sugar cookies! And if you know me well you know I make them for any occasion (not just summertime)!!! So, this summer for the 4th of July we were camping with family and of course I love to make star sugar cookies for the 4th. I love having my kids help me and love seeing how much fun they have rolling, cutting, decorating and of course eating the cookies! So…..can you guess what I took all the way camping?? Yep, I hauled all the necessities (sugar cookie ingredients/rolling pin/cookie cutters/frosting/sprinkles)! I even had one cousin who had never rolled out cookie dough. She was super excited to help! The best part is that the cookies getting eaten before we could even get them decorated! All those at camp had no idea they were allergy/gluten free. They are delicious even camping!!! I have always loved family reunions. I love spending time with family! My dads family has a reunion every year and an extended family reunion every other year (so you can imagine how many reunions I have been to). I believe they started the family reunions the year before I was born. So, not to give away my age but that would mean I have been to over 20, I mean 30 reunions just for one side! Well this last weekend we had a reunion on my moms side. We had a picnic in my aunts back yard and there was swimming, badminton, corn hole, ping pong, games for the little kids and visiting. My mom counted and there were 57 in attendance….so it was a great turn out! Last night Richard and Linda Eyre did a webinar titled, “The Entitlement Trap”. They have written a book that will be released this September and if you haven’t yet purchased “The Entitlement Trap, you can pre-order today for a savings of 33%, in addition to a free gift. The Eyres have put together some powerful, yet simple ideas that will help your children take ownership for their things, money, conflicts, goals, values, choices, and privileges. So, go listen to the FREE Webinar…..I will be listening soon too!!! Well, I hope everyone is enjoying their summer! I love summer! I love having a break from school, picnics, swimming, reunions, bubbles, gardening, scrapbooking, fresh strawberries and raspberries, making cool treats, parks, vacations, but most of all……spending time with my family!!! I haven’t written on my blog for about a month now. Now, you may be thinking I have been oh too busy with all those fun summertime activities I listed above. Well….that is partly the issue but the other is that I got pretty hurt in June and have been recovering. I was cleaning a window (outside) and fell straight back… flat onto my back! For the first 4-5 days I couldn’t hardly move. I am still slowly recovering but doing much, much better! Through this experience I have had much time to just think about all my wonderful blessings! 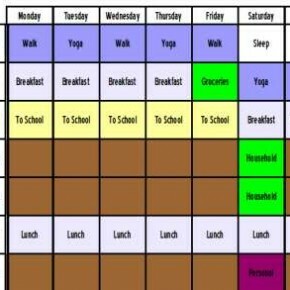 At the beginning of the summer (before I got hurt) I made a summer schedule for my kids. They were going to be very busy. But, then I got hurt and some things had to change…..we had to stop and slow down. So, with the kids help we made a “summer bucket list” and we have been making sure we do something new from our list each day! I love this….I will have to post more about it later. It all started with finding out our little boy was allergic to milk, eggs, wheat and peanuts. Then we found out he would get sick just being around different foods...even if they were being cooked. So, I first searched for recipes that our whole family would enjoy and they were not very good tasting. So, I decided I had to create recipes that I knew I could tolerate along with my family. It has been fun and all those without allergies that I have tested the food on can't even tell that anything is missing!